LAHORE: The history making First Pakistan Golf Federation Long Drive Competition was held at the Hole No 1 (One) of the Lahore Gymkhana Golf Course. This event was noteworthy and epoch making and managed to generate considerable interest in the golfing community of Pakistan. Players of dexterity and aptitude converged to the Lahore Gymkhana Golf Course for a show of ability, strength, power and timing. Divided into three segments, one for ladies, another for amateur golfers and a third one for the mighty golf professionals of Pakistan, the longest drive competition turned out to be a breath taking and hair raising affair as champion after champion took turns to hit the ball the farthest. After the initial qualifying trials, the Ladies who succeeded in entering the semifinals were Sania Osama, Shahnaz Moeen, Ayesha Moazzam, Momina Tarrar, Rimsha, Parkha and Dania. And in Amateur race for qualification the ones who came out successful were Salman Khan,Hassan Hamid,Hussain Atta,Salman Jehangir, Akhtar,Hussain and Noyyan. In the Professionals section the semifinalists were Talat,Latif,Shakeel,Arif,Shahid ,Ahmed and Daniyal. Competition was fierce and left quite a few zealous ones totally strained. However, the extraordinary one managed to retain their positions upfront and entered the final stage amidst huge applause from the eager watchers. Top prize was won by Dania Ayaz of Gymkhana through a drive of 297 yards. Rimsha Ijaz of Defence Raya came second and her driving distance was 280 yards. Third position was secured by Parkha Ijaz(Defence Raya). She drove the ball 267 yards. Top driver was Noyyan Nayyar (Gymkhana) and he hit the ball 368 yards. Second position was achieved by Hussain Hamid (Royal Palm). He drove the ball 357 yards. The high achiever was Daniyal Jehangir (Gymkhana). He was the champion of the day and stood glorified as the longest hitter with a driving distance of 370 yards. Ahmed Baig of Garrison attained the second most powerful hitter position, hitting the ball 354 yards. Another accomplished golf professional Shahid Javed Khan (Gymkhana) ended up third with a driving distance of 340 yards. For the golf professionals the prizes were cash and Daniyal won a prize of Rs 100,000, Ahmed Baig got Rs 75,000 and Shahid was awarded Rs 50,000. The winning amateurs got golf equipment as gifts. 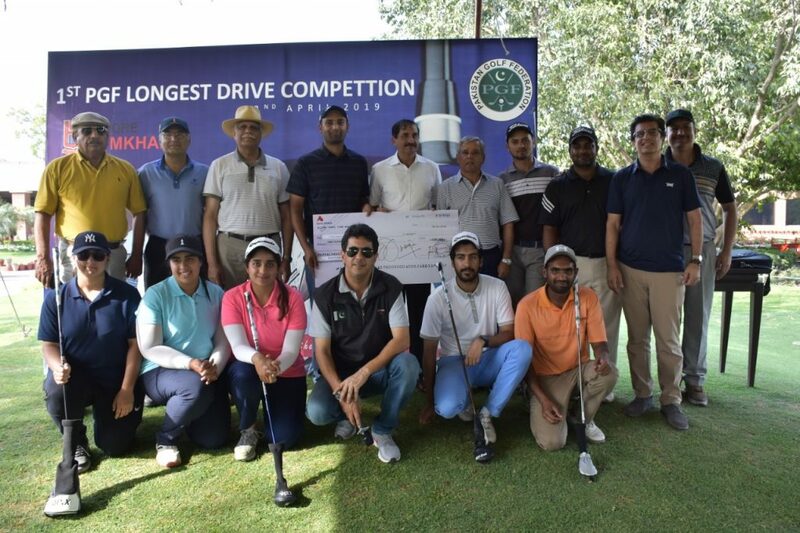 At the conclusion of the 1st PGF Long Drive Competition, the prizes were awarded to the winners by Lt Gen (r) Mian Muhammed Hilal Hussain, President – Pakistan Golf Federation in the presence of Shaukat Javed – Convenor Golf, Omer Zia – Captain Golf, Asad I.A, Khan – Vice President PGF, Maimoona Azam – Ladies Captain, Dr Asma Shami, Dr Ali Haider and participating golfers.